Now that Idemili has put on weight and regrown her feathers she is ready to set off but, having fallen so far behind the other Cuckoos, she is getting a helping hand, or rather wing, thanks to British Airways! On Tuesday, WAF's vet nurse Lucy Kells, and Idemili were flown in style to Turin in the cabin of a 747. Once in Italy, Idemili will be released in the same area where two of the tagged male Cuckoos are also preparing for their long journey south. Idemili will make her southward migration to Africa without her tag so, once she has been released, there will be no further updates posted on her blog. We wish her well on her migration, and who knows, maybe someone will report her ring number in years to come? 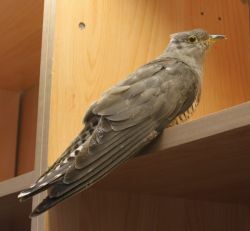 Idemili was tagged on the 10 June and, once a name had been decided on with the funders of her tag, we announced Idemili’s recruitment to the ranks of the Cuckoo project on the 11 July. It was only days after this announcement, having just left Wales, that Idemili was found in a garden in Surrey in need of help, malnourished and having suffered an attack from other birds. taken in to Wildlife Aid. Idemili was taken to the Widlife Aid hospital in Leatherhead and has been making good progress. Staff at both BTO and Wildlife Aid are elated with how far she has come, she has put on weight and has now reached 116g, almost 60% heavier than when she was brought in! She has completed the regrowing of her missing wing feathers and has approximately 5cm left to grow on her tail. Her eye has not fully recovered and the vet who has looked at her has told Wildlife Aid that she has a damaged pupil and that she does not have 100% vision in that eye. However, she is perfectly able to pick caterpillars from leaves in her outdoor aviary so will be able to find food for herself. Wildlife Aid have done a fantastic job of rehabilitating her which has meant that we have had to start thinking about her release. We were able to follow her movements for a month or so when she was in Wales before moving to Surrey. The terrible weather in Wales will have made it difficult for her to find food and no doubt contributed to the state she was found in after being attacked by other birds. She is now heavier than she was when she was first tagged, however, she will need to readjust to finding her own food, coping with the conditions in the real world and the physically challenging demands of migration. Adult Cuckoos are rarely found in the UK in August and most of our tagged males are now either staging in areas to the south of Switzerland or have crossed the Sahara. While a few females may still be in the UK and won’t have embarked on migration yet, Idemili was obviously ready to set off and is now quite far behind schedule. Now that she is back to health we have had to think about whether it is both scientifically and ethically right to reattach the tag to a rehabilitated bird who has already been through such a tough time, and has yet to make it to Africa and the crossing of the Sahara Desert. Whilst it would be very interesting to be able to track a rehabilitated bird, both for science and to gather information for those who invest time in the rehabilitation of individuals, we felt this wasn't appropriate. Whether translocated to staging areas in southern Europe (or straight to Africa) by Wildlife Aid or not, Idemili’s unusual few months and the fact that her journey has been delayed while she recovers will no doubt affect the validity of the science that we gather from tracking her. 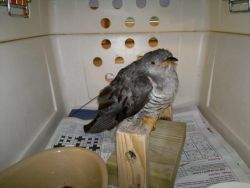 Would the experience affect what she does in the coming months or would it be typical of female Cuckoos? With all these factors in mind, we have decided that she will not be tagged. We are understandably disappointed that we were only able to track such a small part of her journey and that we will not be able to track her further, as I am sure that many Cuckoo sponsors and supporters will also be, but we have to put Idemili’s welfare first and give her the best start in what will be a long journey to her winter destination. In around another week or so her tail feathers should be fully regrown and Wildlife Aid will make a decision about where to release her. We will keep you updated on her blog with any news. To find out more about Wildlife Aid visit their website here or make a donation here – and don’t forget to mention Idemili in the comments box! If you would like to follow one of our Cuckoos, sponsor your favourite here. Last we heard from Wildlife Aid was that Idemilli was still doing well and had reached 104g in weight. Her eye was still healing but was more open and her damaged and lost feather replacements were growing well. Take a look at the photos of her recovery here. Idemili is doing much better now, aided by a change of diet to a larger size of mealworm - between yesterday afternoon (17 July) and the previous day, she increased her weight from 73g to 82g. She is already much livelier according to Lucy Kells and the Wildlife Aid staff, who are doing a fantastic job of looking after her. Even if she continues to make good progress, she won’t be in a state to attempt a crossing of the Sahara any time soon because she would first need to grow the secondaries and tail feathers that she lost when she was attacked by birds. Chris Hewson visited Wildlife Aid near Leatherhead on Saturday to remove the tag from Idemili and check on her condition. She was still very light - weighing only 71g - but this was apparently an increase of 1g from the previous day so some small progress is being made! Hopefully she will continue to make progress. You can read more in the patient updates here.